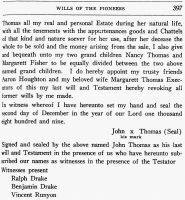 Pennsylvania Marriages, 1700-1821: "Phineas Thomas & Elizabeth Harper, m. 21 Oct 1865." Died - 2 Dec 1809 - Mason County, Kentucky, U.S.A.
"History of Maysville and Mason County: Chapter Eight, Court Records, Wills of the Pioneers," pp. 396-397. Mabel Dodele, "A Trace of Thomas," p. 247.